There are several advantages of having your kids in the kitchen with you as much as possible while cooking. They are more likely to try new foods if they helped make them, they learn how to create meals for themselves instead of relying just on packaged foods, and it opens up discussions into health, science, math – and just a non-threatening environment to have conversations with older kids. Including children in meal prep varies with age. Here are some age-appropriate tasks for a variety of ages. Keep in mind your own child‘s maturity and care; some children are able to safely use knives or handle breakable dishes with adult guidance earlier than others. Toddler-early preschooler: count out silverware and other non-breakable dishes, bring condiments in non-breakable jars to table or serving area, help choose produce and break to table, add pre-measured ingredients to a mixing bowl. By the time children are in late elementary, they’re able to help with nearly all aspects of meal preparation. As always, supervision is key, and it’s important to know your own child‘s limitations. If your child consistently shows care while using a butter knife, you can graduate to a sharper knife on easy-to-cut objects. Start with things that won’t roll around, like blocks of cheese, before trying round objects. Using a crinkle cutter is also a fun way to help cut veggies while still being safer than a sharp knife. It’s also helpful to have kid-size (or at least smaller) oven mitts – too large oven mitts can make it more difficult to handle a dish without spilling. 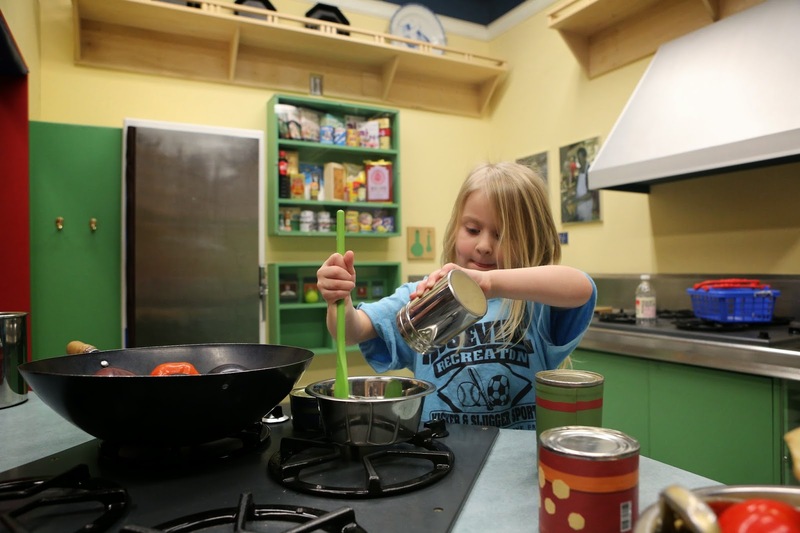 Always be sure to emphasize kitchen safety when cooking with kids – pot handles set so they aren’t over the edge of the stove, not touching a dish if you aren’t sure if it’s hot, handling sharp implements carefully, etc. Above all, make it fun! The more fun you make it, the less like a chore it seems, and the more likely your kids will be to want to help.